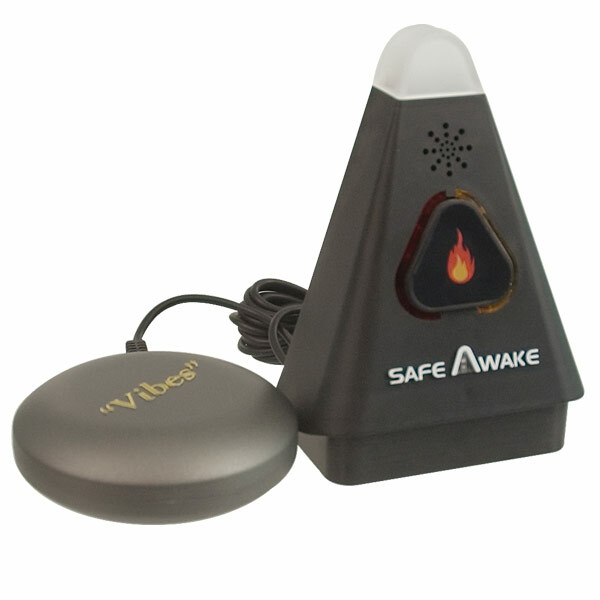 "Get Vibrating, Visual & Sound Alerts of Smoke/Fire"
The SafeAwake instantly wakes you from deep sleep to alert you to smoke and fire. It works with your own smoke alarm system, triggering all your senses with a motorized bed shaker, a flashing light and a low frequency, high decibel square wave sound you can actually hear. The Problem: Smoke alarms in the United States use high frequency, high decibel sound notification to warn people of fire emergencies. As people grow older they lose their high frequency hearing. 1 in 3 people over the age of 65 years, and 1 in 2 people over the age of 75 years have difficulty hearing or cannot hear this high frequency alarm. Of course, these same challenges are faced everyday by the deaf and hearing impaired individuals. The Solution: SafeAwake's smoke alarm aid listens for the smoke alarm emergency sound signal. It then provides a loud, low frequency square wave sound notification and sends a non-continuous signal to the bed shaker that literally pulls each and every sleeper from deep slumber and warns them of smoke and possible fire. Modern research has made possible the SafeAwake smoke alarm aid with its patented sound reception to hear conventional smoke alarms when they activate. It comes with two of the most effective means of emergency notification: the low frequency, high decibel square wave sounder, and the non-continuous, pulsated tactile stimulator to awaken a sleeping person. The SafeAwake is designed to work in partnership with a properly installed, properly working, traditional smoke alarm. When activated, a smoke alarm sends out a T3 alarm that instantly triggers the SafeAwake. The SafeAwake is a model of high-tech simplicity. There is a test button, an automatic shutoff and restart, a turn-on indicator light, a battery backup in the event of electrical failure; and even a system to tell if the batteries are weak. It works anywhere. It's light, compact, portable, and simple. No other device offers the safety features and benefits of the SafeAwake. Fast and easy setup for homes, hotels, motels, hospitals, senior citizen residences, independent and assisted care facilities, in fact, everywhere that people sleep. IMPORTANT NOTE: SafeAwake is not a fire detection system. It must be combined with an approved, properly installed and operating smoke alarm. The SafeAwake saves sleeper's lives through an additional means of fire notification which has been proven more effective. - Simplicity - Simply plug into any bedside outlet and sit the SafeAwake on a bedside table or hang on the wall. (No additional hard-wiring required.) The bed shaker fits directly under the mattress. - Universality - Responds to any U.S. domestic or commercial smoke alarm produced after 1996.